Funds raised from the Arts Fair will be used to upgrade the Epping Boys High School hall which will also be available for community performances. TWT on-the-spot PHOTO. ARTIST Livvy Moore claimed first prize at this year’s Epping Arts Fair staged last week at Epping Boys High School. Pictured is Betty Ockerlander, one of the Fair sponsors from McGrath Epping with Beecroft resident Belinda Jones who purchased Livvy’s winning painting and Epping Boys High principal Timothy O’Brien. Second prize winner was Ashley Zhurawel with Kathryn Smoker receiving Highly Commended. Winner of this year’s People’s Choice Award is Jumae Jane Kim of Mosman Bay. 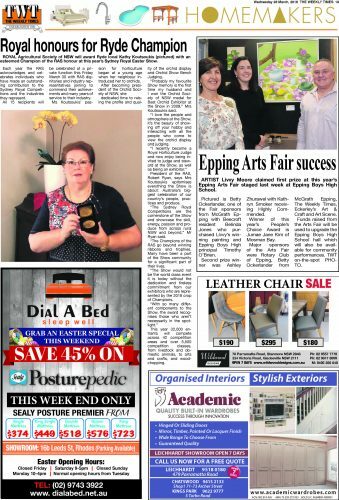 Major sponsors of the Arts Fair were Rotary Club of Epping, Betty Ockerlander from McGrath Epping, The Weekly Times, Eckerley’s Art & Craft and Art Scene.